29 August 1985 was a very proud day in the history of Epping Cricket when one of our own made his Test debut for Australia. Dave Gilbert had indeed scaled the heights to line up in an Ashes Test that day, having started his journey in September 1977 in our NDCA D Grade side. Dave went on to represent Australia in 9 Tests. He also had a distinguished First Class career in Australia and England and went on to an even more distinguished career as a cricket administrator. 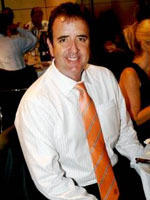 He is currently CEO of CricketNSW but has never forgotten the start he received here at Epping and has remained a loyal and active friend of the Club to this day. Dave’s journey to cricket’s highest mountain was mirrored by another who also never forgot where he came from and the friends he made on the way. 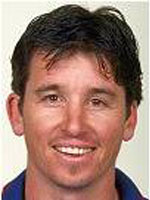 Gavin Robertson became our second Test representative, debuting for Australia in Test Cricket in Chennai on 6 March 1998 and appeared in a further 3 Tests. Gavin continued his involvement with Epping after retiring from playing, including stints as Club Coach, and regularly gives up his time to attend our Annual Dinner as MC.